Multi-platinum-selling global superstar Carrie Underwood has spent the last month sharing her critically-acclaimed album Cry Pretty with the world. 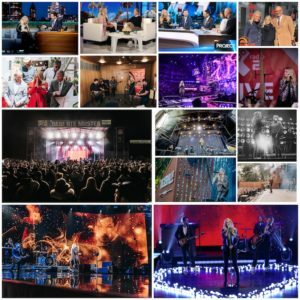 From coast-to-coast U.S. promotion including an emotional profile with CBS Sunday Morning, impromptu karaoke with Jimmy Fallon and The Ellen Show, Underwood has also traveled to the Netherlands, Germany and Australia. In the Netherlands, she promoted the album in Amsterdam, as well as, performing at the 3rd annual Tuckerville Festival in Enschede, which was attended by fans from all over Europe. The trip to Holland was followed by a round of promotion in Berlin, Germany before U.S. appearances on The Tonight Show Starring Jimmy Fallon and The Ellen Show, as well as, stellar album reviews fromRolling Stone, NPR and Consequence of Sound. Additionally, Carrie introduced a new song and show open for her sixth season as the voice of Sunday Night Football, primetime television’s No.1 weekly program. Before heading to Australia for more international promotion, Underwood was joined by family and friends for her star ceremony and induction into the Hollywood Walk of Fame, as well as, a performance at the iHeart Radio Music Festival in Las Vegas, NV. In Australia, she performed in front of a live audience on The AFL Footy Show’s Grand Final Edition from Melbourne’s Rod Laver Arena and headlined the iconic Deni Ute Muster’s 20thAnniversary Festival in Deniliquin, New South Wales, for a crowd of nearly 18,000 people. In addition to appearances on ABC News Breakfast and her third on Australia’s nightly news and entertainment program, The Project, she performed an outdoor concert live from Melbourne’s Federation Square on Sunrise, the No. 1 breakfast show, as part of their annual Grand Final Brekky Party, leading up to the country-wide AFL Grand Final weekend celebrations. In the coming weeks Underwood will have several performances including the 2018 American Music Awards airing on ABC, where she is also nominated as Favorite Female Artist – Country. Her performance on Jimmy Kimmel LIVE! will air on October 9 following the AMA broadcast. She is also being honored and will perform live at the 2018 CMT Artists of the Year special on October 17, which is dedicated to the women of Country music – past, present and future. The following week she will join with the Grand Ole Opry in the fight against breast cancer on October 26, performing two shows for the special 10th Annual “Opry Goes Pink.” On November 14, she and Brad Paisley will co-host the CMA Awards for the 11th consecutive year. Later that week, she will be inducted into the Oklahoma Hall of Fame. Cry Pretty debuted at No. 1 on the Billboard 200 and two weeks at No. 1 on the Billboard Top Country Album Charts, making Underwood the only woman in history to land four country albums at the top of the all-genre Billboard 200 chart, as well as the first female country act to top the Billboard Artist 100 Chart. The critically-acclaimed album is the best-selling Country album debut of 2018. Cry Pretty’s debut week also marks the most first week streams by any female in Country music. This is Underwood’s seventh consecutive album to debut at No. 1 on the Top Country Albums chart, representing all of her first seven albums including her Greatest Hits: Decade #1. The album is Underwood’s first release on Capitol Records Nashville and her first time co-producing alongside David Garcia. She co-wrote nine of the songs on the album including her current single, “Love Wins,” with David Garcia and Brett James. She recently released the official music video for “Love Wins,” which was directed by Shane Drake. View HERE.